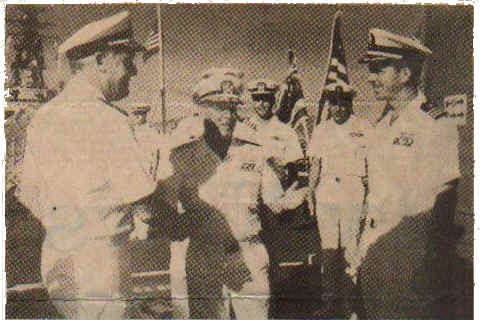 Admiral James D. Watkins, Chief of Naval Operations (far left), greets Rear Admiral Henery F. Boyle, Commander Naval Base (second from left), during a recent visit to the USS Goldsborough (DDG-20). Also on hand to welcome the CNO aboard are, from left to right, Lt. Cmdr. Lawrence M. Kryske, Goldsborough’s executive officer, Master Chief Personnelman David E. Perkins, command master chief of the Goldsborough and Cmdr. Michael G. Mullen, Goldsborough’s commanding officer. Brass was polished and decks were scrubbed. Intense effort was given to keep the 22-year-old ship as meticulous as the day it was commissioned. Calm demeanors masked the anticipation felt by 22 officers 312 enlisted men as the morning dawned. Suddenly, a stately sedan turned the corner and made its approach toward the USS Goldsborough (DDG-20). Head lights glowing and a sole four star flag flustering in the breeze, the car motored silently down the pier, coming to a smooth halt at the Goldsborough’s bow. Admiral James D. Watkins, the Chief of Naval Operations, strode purposefully from the car to be met on the quarterdeck by Commander Michael G. Mullen, Goldsborough’s commanding officer. The CNO returned Cmdr. Mullen’s salute with one of his own, and the pair of senior officers, accompanied by Rear Admiral Henry F. Boyle, Commander, Naval Surface Group, Middle Pacific, and Commander, Destroyer Squadron Thirty three, Captain Lawrence B. Blumberg, were off on a tour of Goldsborough. Admiral Watkins and his entourage visited some of Goldsborough’s spaces, including Combat Information Center and the mess decks. The CNO also found time to discus with the officers and chief petty officers, in their respective messes topics such as the combat systems upgrade and manning levels in critical Enlisted Classification codes (NEC’s). Prior to his departure, Admiral Watkins expressed his appreciation for the outstanding condition of the ship and the enthusiasm of the crew members he met. He remarked that he saw Goldy through the periscope in 1964 when he was Commanding Officer of the submarine USS Sncok iSSN-S921.